If the future of magazine apps for the iPad was once in the hands of Wired and Conde Nast, the release of Hearst Media‘s Popular Mechanics Interactive Edition may mark the beginning of a power shift. Coded completely in house by Hearst’s programmers (using Objective-C) the Popular Mechanics Interactive Edition clocks in at about 27MB while delivering on an interactive 3D model, a live data input earthquake map, video, and flip through as well as navigate-by-interest capabilities. Subtle features like slide animation add subtle character to the app in a way that’s augments as opposed to distracts from the experience. Everything is clean, fluid, and easy to use in a general sense, but it’s also attractive to people looking for interactivity. My favorite interactive piece is a 3D model embedded within the DIY Home article. Tapping on the model allows users to drag a model of the tool-charging workbench around to see different perspectives while another button animates the construction process and yet another details the exact pieces of wood required to make the project a reality. These are the kinds of features that will outlive the natural life cycle of an article, as is the live updating earthquake map that continues to feed live data long after the next issue of Popular Mechanics is released. I would love to see, in the future, a way for these facets of the app to be both searchable and repurposed effectively. 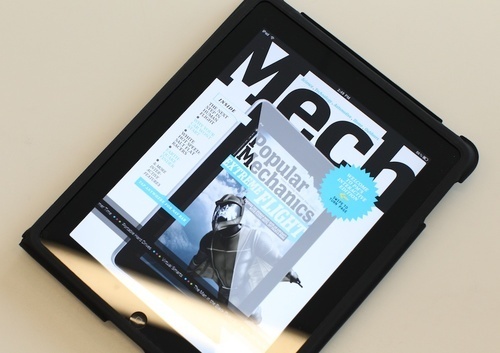 The Popular Mechanics iPad app also delivers on bookmarking and adds social media integration that allows users to share on Facebook, Twitter, or via email. There’s even a live feed from the website that keeps readers up to date with more current news. Although the app crashed once during use (I was using the navigation bar at the bottom), I’m not sure how frequent this is occurs or if this is a once-in-the-app’s lifetime occurrence. I would have also liked to have seen landscape mode support but can understand how this would add a lot of work on the back end. In a regular magazine it’s easy to tell what the editors want to emphasize in any given issue of a magazine. Feature stories get more pages while minor points receive minimal space and it’s easy to flip through and find the topics that the editors consider most important. On the iPad seeing this distinction is more difficult, and I wonder if anyone will feel that loss in the same way that I did. It’s great to be able to follow personal interests by interacting more with specific elements of the magazine, but in this edition I had to flip through the entire magazine a few times before I was finally convinced I hadn’t missed a story or important feature. Which brings me to another point entirely. This app isn’t the entire issue of Popular Mechanics. It’s most of it sure, but for any staunch subscriber who looks forward to reading Popular Mechanics cover to cover each month, this could be the difference between a happy iPad reader or someone who feels like they lose out either way. Hopefully Hearst will fix this in the future without changing the price of the app on readers. Although still not perfect, it feels like Hearst is getting closer to evening out a revenue model for magazine apps. At $1.99, Popular Mechanics is priced two dollars cheaper than the actual newsstand price (but buying monthly would still prove more expensive than a print subscription). Hopefully this means that Hearst will figure out how to integrate regular subscriptions models into the mix. Doing so would put them in the position to literally define the industry price wise. Bottom Line: Popular Mechanics on the iPad is probably the closest anyone has come to building what everyone envisioned when the media started talking about actually buying and interacting with magazines on the iPad.